Hurricane Harvey has left a path of destruction in its wake. The flooding in Texas, and especially in Houston, has been devastating. Over 50 inches of rain has immobilized our nation’s 4th largest city and has left thousands of residents stranded, some without shelter or basic necessities like food or water. This once-in-a-lifetime storm underscores the power of water and the devastation it can inflict on a community. Our thoughts and concern go out to the families that have been evacuated from their homes as well as to the many businesses, large and small, that have been shut down. Storms and accompanying floods are acts of nature beyond our control. But it doesn’t just take a catastrophic event like the one in Houston to cripple a business. Disaster can strike any time. 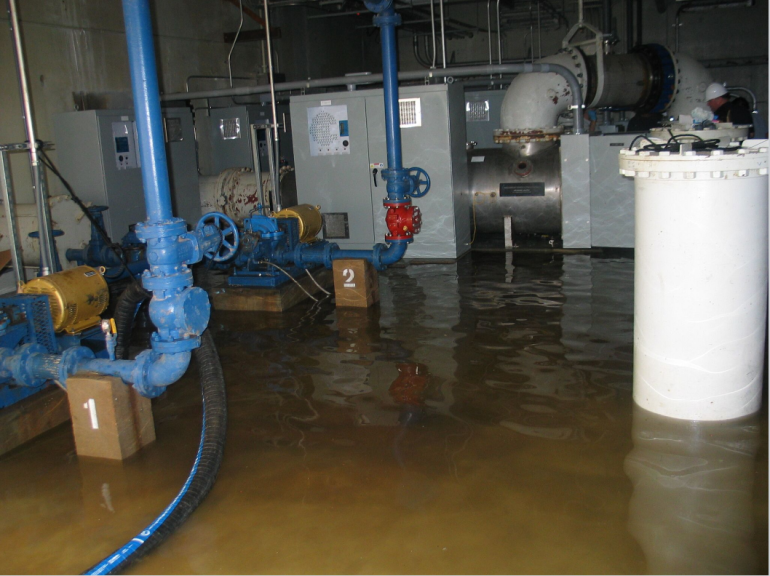 Water treatment facilities, for example, can be flooded due to faulty pumps and motors that overheat and fail, causing ruptures in water lines. The image shown highlights the damage that could happen when pumps or motors malfunction. Can these events be avoided? Quite possibly. Many of these types of incidents result from faulty equipment that is not checked on a consistent basis or that has not been properly maintained. Manual maintenance checks can help, but many of these accidents occur at unexpected times – such as during off hours when maintenance staff is not on site. Often times, equipment is not monitored consistently as day-to-day issues arise and maintenance staff gets pulled off on other projects. But running a business with equipment that is not properly maintained is a risky proposition. Even if equipment is periodically maintained, a malfunction can still occur at any time, day or night. If your equipment shuts down, your business operations shut down. That means your customers are not served – a real, bottom-line impact for your business. So what’s the alternative? One excellent solution is to conduct real-time monitoring of your equipment. At TDG Technologies, we’ve pioneered wireless technology that allows businesses such as water treatment facilities to easily install SmartHAWK™ wireless sensors on industrial equipment and monitor performance in real-time using SmartHAWK™ Web, our online interface. SmartHAWK™ wireless sensors deployed on mission-critical equipment maintain 24/7 surveillance on asset performance. Real-time alerts are sent to any smartphone or mobile device, such as when vibration or temperature levels rise above pre-established thresholds. Operation Managers are then immediately notified, quite possibly before a catastrophic event occurs. Armed with a real-time monitoring system, managers can take action to eliminate or mitigate unforeseen problems with their valuable assets… and potentially avoid business-crippling events like a flooded plant. If you want to learn more about our SmartHAWK™ line of wireless industrial sensors, check out our products and other information at www.tdgtechnologies.com or contact us directly at (760) 466-9234.